The USO celebrated its 75th anniversary last week, with officials estimating the organization has served more than 35 million American servicemen from World War II to the present day. The milestone was marked at a gala in Washington attended by Medal of Honor recipients, USO volunteers, active duty personnel, veterans, members of Congress, and stars of stage, screen and music. “Certain organizations are the physical manifestation of the support of the American people, and I don’t know an organization that does it any more than the USO,” said Marine Corps Gen. Joseph F. Dunford Jr., the chairman of the Joint Chiefs of Staff. USO San Diego is a major location for the organization, with the 10,000-square-foot center at Lindbergh Field the largest in the world. When the draft began prior to World War II, President Franklin D. Roosevelt asked charitable organizations to band together to provide morale and recreation services to draftees. The United Services Organization was chartered on Feb. 4, 1941, by the Salvation Army, the Young Men’s Christian Association, the Young Women’s Christian Association, the National Catholic Community Service, the National Travelers Air Association and the National Jewish Welfare Board. 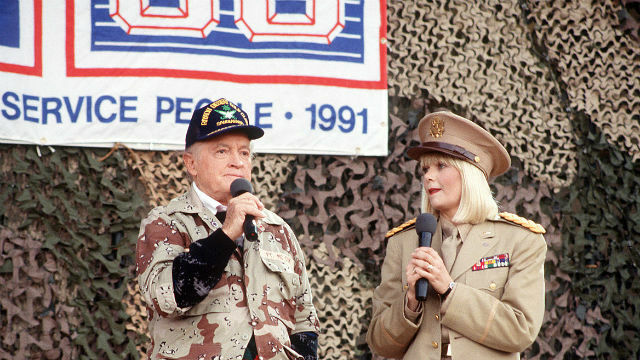 Actor-comedian Bob Hope — a man who would be virtually synonymous with the organization — held the first camp show in 1941, and for the next five decades, he was the face of the organization. By the war’s end, some 1.5 million Americans had volunteered for the USO. The USO went where the military did, establishing centers in Korea, Vietnam, Bosnia, Somalia, Kuwait, Iraq and Afghanistan over the years. There are also centers at major airports that provide a place for service members and their families as they travel, and the organization also helps service members as they transition out of the military.